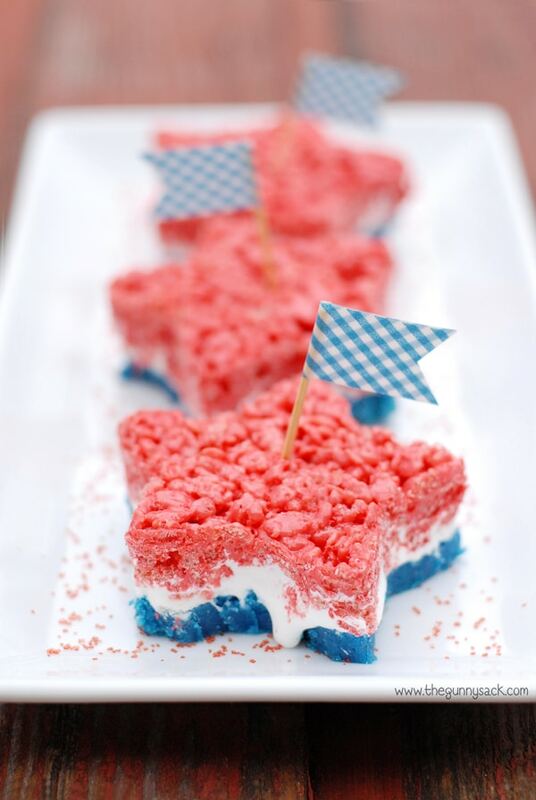 These patriotic, star-shaped, Ooey Gooey Red White and Blue Bars have a blue cake mix crust with soft marshmallow cream in the middle and red Rice Krispies treats on top. 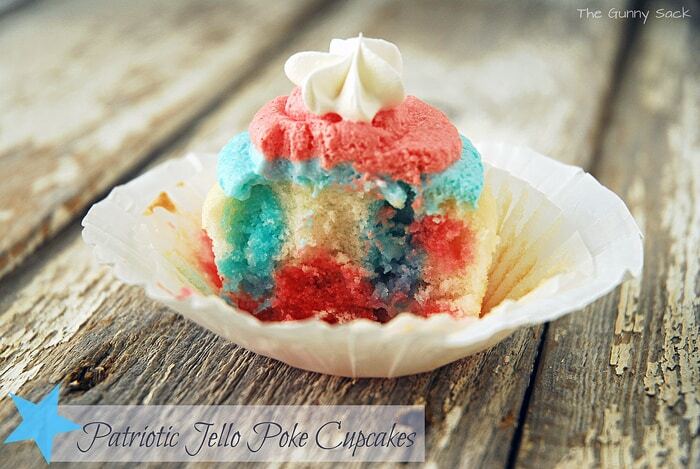 They are perfect for Memorial Day, 4th of July and Labor Day. With summer about to kickoff, I just couldn’t resist making another variety of ooey gooey bars! The days are getting longer, the temps are rising and the kids have less than 20 days of school left. We are so excited for summer and are making plans for our summer vacations. There will also be so many barbecues, picnics, and parties. 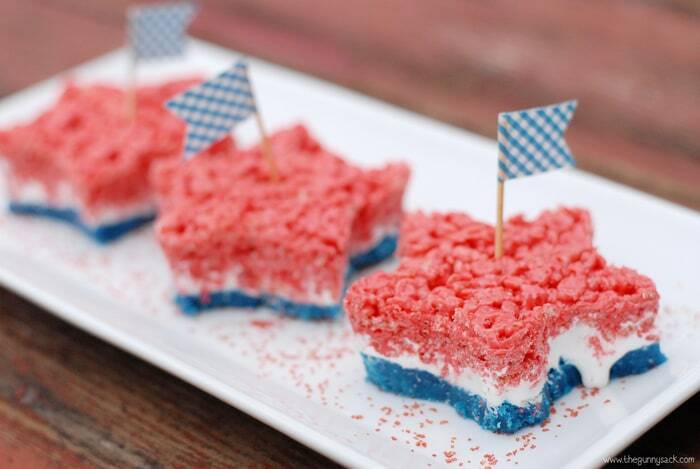 These Red White and Blue Bars are perfect for summer celebrations, especially Memorial Day and the 4th of July! 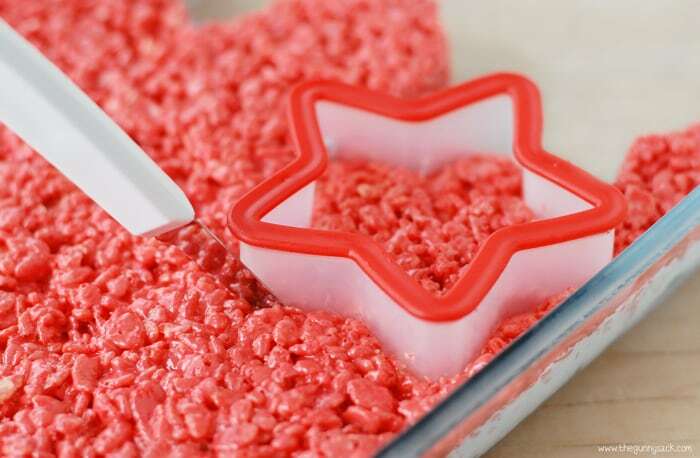 With a cake mix crust, a Rice Krispie treat top and oozing marshmallow cream in between, who could resist these star-shaped treats. Whenever I share my ooey gooey bars, everyone loves them and their favorite part is usually the marshmallow cream layer! Add a washi tape flag and a few sprinkles to the platter and these bars are ready for the party! Mix together a white cake mix, eggs, oil and blue food coloring. Press into a greased 9×13 pan and bake at 350 degrees for 10-13 minutes. Remove the pan from the oven and top with marshmallow cream. As the marshmallow cream warms it will start to spread. Carefully spread it out over the cake mix crust. Add red food coloring and stir until the color is even. Mix in Rice Krispies and gently stir until well coated. Drop by large spoonfuls over the marshmallow cream layer and carefully spread out evenly. Finally, firmly press the top layer down into the marshmallow cream to really hold things together. Cover the bars and cool completely in the fridge. 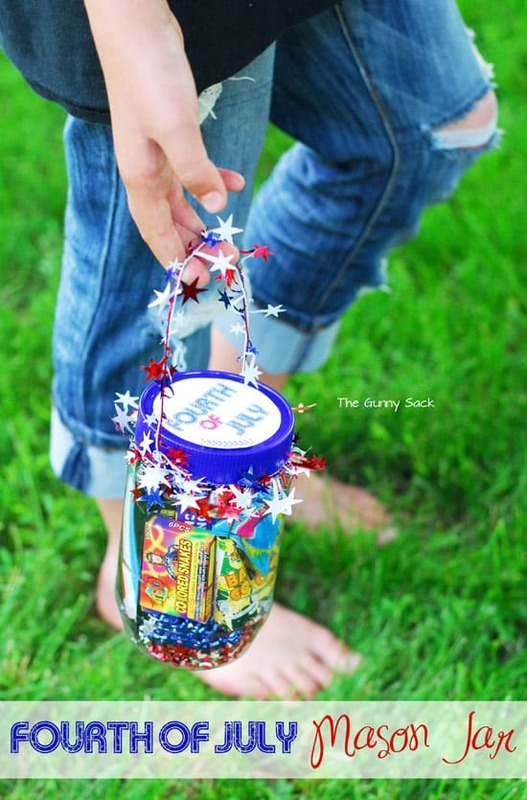 While the patriotic bars are cooling, make some washi tape flags. Center a toothpick in a strip of washi tape. 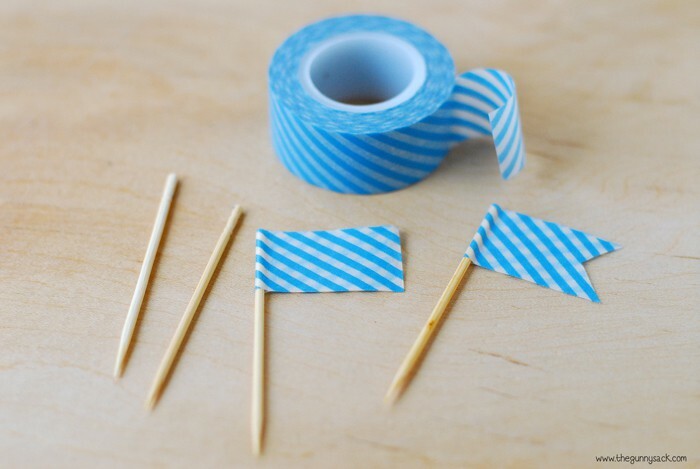 Fold the washi tape in half, over the toothpick. Then, cut a small “V” into the end of the flag to make the little points. 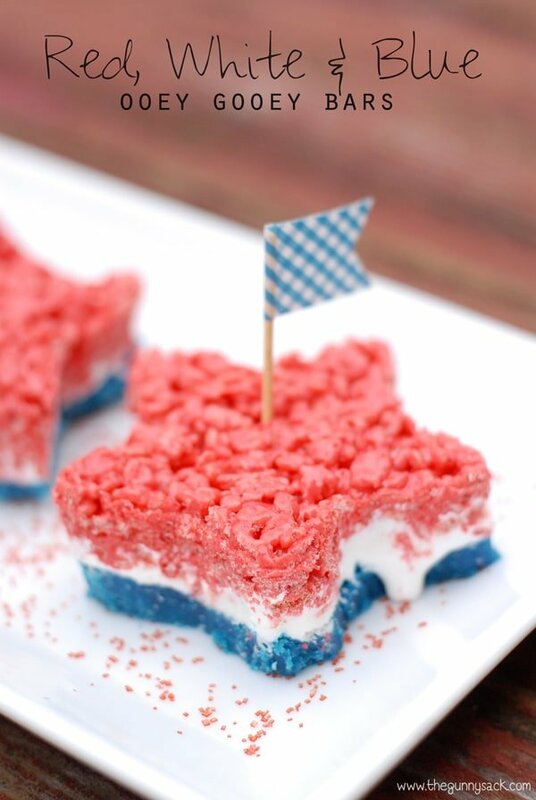 Before serving, remove the red white and blue bars from the fridge and use a star-shaped cookie cutter as a template for cutting out the stars. I found that it didn’t work to cut the bars with the cookie cutter because they were too hard and once they were soft, cutting with the cookie cutter squished the marshmallow cream out. 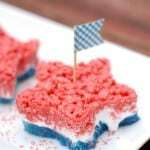 Place the star-shaped Rice Krispie Treats on trays and add the washi tape flags. As they warm up the marshmallow cream will soften and start to ooze out! These Red White and Blue Bars are ooey gooey and perfect for Memorial Day, 4th of July and Labor Day. 1. To get more vibrant red and blue, use gel food coloring instead of liquid drops. 2. To help spread out the rice krispie treats, put your hand in a plastic baggie with a little butter on it and use your covered hand to gently spread it out. 3. 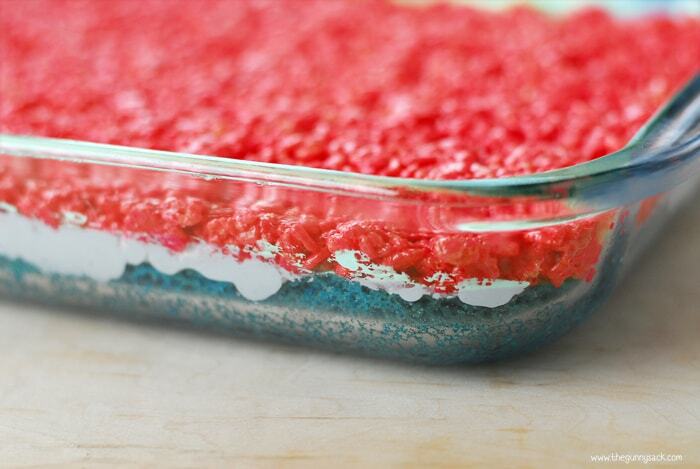 Top with red, white, and blue sprinkles for even more festive fun. 4. Don’t want to bother with making star shapes? Just cut the bars after chilling them like you would regular rice kripsie treats. 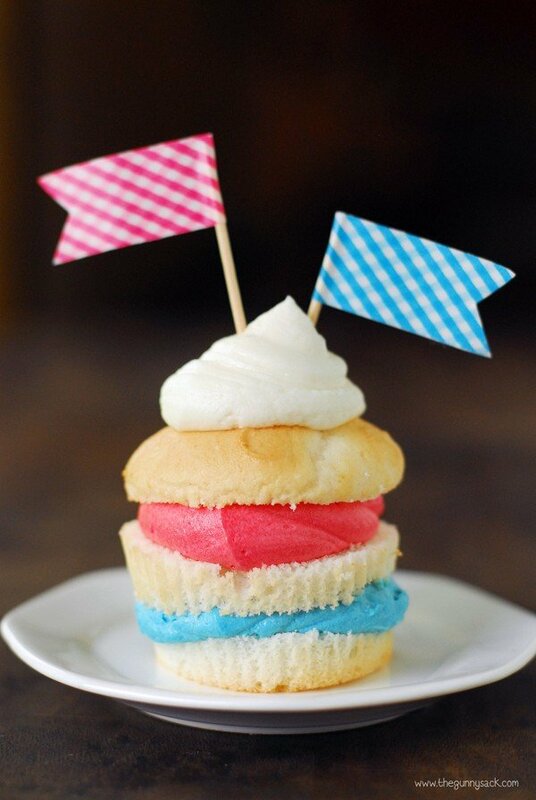 Mix together a white cake mix, eggs, oil and blue gel food coloring. I used gel paste because it is so concentrated. Press into a greased 9×13 pan and bake at 350 degrees for 10-13 minutes. Remove from the oven and top with marshmallow cream. As the marshmallow cream warms it will start to spread. Carefully spread it out over the cake mix crust. In a large bowl, melt butter in the microwave. Add mini marshmallows and stir to coat. Microwave for 45 seconds and stir until smooth. (If the marshmallows aren’t completely melted, microwave for an additional 30 seconds.) Add some red gel food coloring and stir until the color is even. Mix in Rice Krispies and gently stir until well coated. Drop by large spoonfuls over the marshmallow cream layer and carefully spread out evenly. Finally, firmly press the top layer down into the marshmallow cream to really hold things together. Cover the bars and cool completely in the fridge. Before serving, remove the fridge and use a star shaped cookie cutter as a template for cutting out the stars. I’m so excited! Will let you know how they turn out! Your so creative! Hi, this looks like a delicious and easy recipe. I’m going to make a few batches Friday to bring to parties throughout the 4-day weekend. How should I store them so they’ll still taste great on Monday night – fridge or freezer? Thanks! If I make these the day before, will they be too hard when I try to serve them? I don’t usually comment but I made this recipe last Fourth of July and they were so popular. I enjoyed them and everyone else loved them! They look so nice and are soooo simple to make. I didn’t even cut them into the star shapes to make it more simple. I planned to make these for Christmas with red and green food coloring but forgot!i Instead I’ll be making them this week for Valentine’s Day with pink and red which I think will look great. Thanks so much for stopping back to let me know, Nathaniel! That is a great idea. I will have to put that on my blog calendar for next year! do I skip using water even though the box mix says so? do you really only bake the cake for 10-15 mins??? Isn’t it raw??? Yes, you only cook them that long. The crust is like cake mix cookies rather than cake. These sound like such a yummy treat!! Love the cake + marshmallow + crispy treat combo! I seriously LOVE these Tonia! And I know my kiddos would too 🙂 So fun! These are so attractive and look good enough to grab and eat right off the page! I’m missing something though. If they’re too hard to cut with a cookie cutter right out of the refrigerator but will squish the marshmallow fluff out if you let them warm up – how do you get them into the star shape? Thanks Tavette! I used the cookie cutter as a template and cut around it with a knife. Have a great Memorial Day! These are SO perfect for summer! 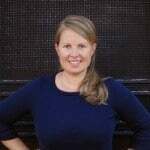 Love all your gooey bar variations….now I need to try them!!!! Thank you! We love all of them too and we are really looking forward to summer! These are so freakin’ adorable! You are so creative lady! You are on the ball! …let me say that I was about to tell you how prepared you are for July 4 only to stop myself because I realized it’s Memorial day that is coming up. Obviously applicable for both! And super delicious and cute looking. Very true…they will work for both holidays! Thanks Erin!